Broomfield, officially the City and County of Broomfield is a consolidated city and county in the U.S. Start off your visit on the 21st (Thu): engage your brain at Butterfly Pavilion and Insect Center and then tour the pleasant surroundings at Majestic View Park and Nature Center. Before you visit Broomfield, use our trip planner to discover what you can do and see there. Denver to Broomfield is an approximately half hour car ride. Expect a daytime high around 56°F in March, and nighttime lows around 32°F. Cap off your sightseeing on the 21st (Thu) early enough to travel to Scottsdale. Scottsdale is a city in the eastern part of Maricopa County, Arizona, adjacent to the Greater Phoenix Area. On the 22nd (Fri), browse the exhibits of Desert Botanical Garden and then see the interesting displays at Musical Instrument Museum. To find reviews, where to stay, and more tourist information, read Scottsdale visit planner. Explore your travel options from Broomfield to Scottsdale with the Route module. Plan for warmer temperatures traveling from Broomfield in March, with highs in Scottsdale at 82°F and lows at 57°F. Finish your sightseeing early on the 22nd (Fri) to allow enough time to drive to Grand Canyon National Park. On the 24th (Sun), hike the day away at Bright Angel Trail. The adventure continues: explore the stunning scenery at Grand Canyon South Rim, take some stellar pictures from Mather Point, tour the pleasant surroundings at Rim Trail, and hike along South Kaibab Trail. To see where to stay, traveler tips, other places to visit, and more tourist information, you can read our Grand Canyon National Park trip itinerary planner. Getting from Scottsdale to Grand Canyon National Park by car takes about 4 hours. Traveling from Scottsdale in March, expect Grand Canyon National Park to be much colder, temps between 57°F and 23°F. Finish your sightseeing early on the 25th (Mon) to allow enough time to drive to Sedona. Kick off your visit on the 26th (Tue): contemplate in the serene atmosphere at Amitabha Stupa & Peace Park, then admire the striking features of Chapel of the Holy Cross, and then take in the dramatic natural features at Cathedral Rock. Here are some ideas for day two: relax and rejuvenate at some of the top local wellness centers, admire all the interesting features of Red Rock Scenic Byway (SR 179), and then take in the dramatic natural features at Bell Rock. For more things to do, reviews, other places to visit, and other tourist information, refer to the Sedona travel itinerary planner . You can drive from Grand Canyon National Park to Sedona in 2.5 hours. 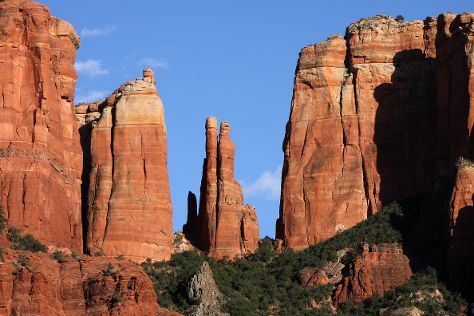 When traveling from Grand Canyon National Park in March, plan for a bit warmer days in Sedona, with highs around 67°F, while nights are much hotter with lows around 45°F. Wrap up your sightseeing on the 27th (Wed) to allow time to travel back home.